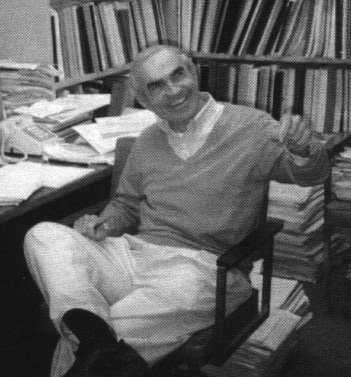 University of Colorado, Boulder, Physics Professor Emeritus Asim Orhan Barut died December 5th, 1994, in Denver, Colorado. He was 68 years old. Prof. Barut was born in Malatya, Turkey, on June 6, 1926, to Sabit Asim and Serife Asim. He married Pierette (Gervaz) Barut on July 2, 1954. He became a naturalized US citizen in 1962. He received his undergraduate diploma in 1949 and his Ph.D. degree in 1952 from the Eidgenossiche Technische Hochschule in Zurich, Switzerland, where he ws a research associate from 1950-53. He did postdoctoral work at the University of Chicago from 1953-54 and was an assistant professor at Reed College (1954-55) and on the faculty at Syracuse University (1956-61). Dr. Barut joined the University of Colorado faculty in 1962 and served for 32 years. He contributed to theoretical and mathematical physics and wrote more than 500 articles and published six books, some of which are classics in the field. He edited an additional 25 books. At CU, he was co-director of the Institute for Theoretical Physics from 1970-72 and received faculty research fellowships in 1968-69, 1972-73, and 1984-85. He was awarded the university's faculty research lectureship in 1986-87. He also served on numerous editorial boards and was a visiting professor to a variety of institutions, including the United Nations, the University of Munich, the Max Planck Institute, and in numerous international cities including Caracas, Venezuela, Edinburgh, Scotland, Ankara, Turkey, Warsaw, Poland, and Stockholm, Sweden. He also directed a number of international physics conferences during his career. In 1991, Dr. Barut received the Age of Science Award from the Turkish Ministry of Culture. Previously, his native country had honored him in 1982 with the Medal of Sciences and with an honorary university degree in 1987. He is survived by his wife of Boulder; two daughters, three sisters, all of turkey; and two grandchildren. Preceding him in death were a son and two brothers. M. O. Scully, "Asim Orhan Barut: 1926-1994," Found. Phys. 28, 355 (1998) [PDF-60K]. J. P. Dowling, "Asim Barut: A Personal Tribute," Found. Phys. 28, 357 (1998) [PDF-96K]. As his students best remember him: Professor Asim Barut in his office on the campus of the University of Colorado at Boulder, circa 1990. Quantum Systems, Barut, Asim O.; Feranchuk, I. D.; Shnir, Yu M., 1995, ISBN: 9810220995, World Scientific Publishing Company, Incorporated. Polarization Dynamics in Nuclear & Particle Physics, Barut, Asim O., Paver, N.; Penzo, A.; Raczka, R., 1993, ISBN: 9810214235, World Scientific Publishing Company. Selected Scientific Papers of E. U. Condon, Barut, Asim O., 1991, ISBN: 0387974202, Springer-Verlag New York. Selected Popular Writings of E. U. Condon, Barut, Asim O., 1991, ISBN: 0387974210, Springer-Verlag New York. Spin & Polarization Dynamics in Nuclear & Particle Physics, 1990, ISBN: 9810200188, World Scientific Publishing Company. New Frontiers in Quantum Electrodynamics & Quantum Optics, Barut, Asim O., 1990, ISBN: 0306436698, Plenum Publishing Corporation. Geometry & Physics, Barut, Asim O., 1989, ISBN: 8870882241, American Institute of Physics (A I P Press). Dynamical Groups & Spectrum Generating Algebra, Barut, Asim O.; Bohm, A.; Ne'Eman, Yuval, 1988, ISBN: 0318420643, World Scientific Publishing Company. Dynamical Groups & Spectrum Generating Algebra, Barut, Asim O.; Bohm, A.; Ne'Eman, Yuval, 1988, ISBN: 9971501473, World Scientific Publishing Company. Selected Scientific Papers of Alfred Lande, Barut, Asim O. (ed. ), 1987, ISBN: 9027725942, Kluwer Academic Publishers. Conformal Groups & Related Symmetries - Physical Results & Mathematical Background, Barut, Asim O. (ed. ), 1986, ISBN: 0387171630, Springer-Verlag New York. Quantum Space & Time - The Quest Continues, Barut, Asim O. (ed. ), 1984, ISBN: 0521319110, Cambridge University Press. Quantum Electrodynamics & Quantum Optics, Barut, Asim O. (ed. ), 1984, ISBN: 0306417308, Plenum Publishing Corporation. Quantum Theory, Groups, Fields & Particles, Barut, Asim O. (ed. ), 1983, ISBN: 9027715521, Kluwer Academic Publishers. Electrodynamics & Classical Theory of Fields & Particles, Barut, Asim O., 1980, ISBN: 0486640388, Dover Publications, Incorporated. Foundations of Radiation Theory & Quantum Electrodynamics, Barut, Asim O. (ed. ), 1980, ISBN: 0306402777, Plenum Publishing Corporation. Group Theory in Non-Linear Problems, NATO Advanced Study Institute, Barut, Asim O. (ed. ), 1974, ISBN: 9027704120, Kluwer Academic Publishers. Studies in Mathematical Physics, NATO Advanced Study Institute, Barut, Asim O. (ed. ), 1973, ISBN: 9027704058, Kluwer Academic Publishers. Lectures in Theoretical Physics., Barut, Asim O. (ed. ), 1973, ISBN: 0870810472, University Press of Colorado. Scattering Theory, Barut, Asim O. 1969, ISBN: 0677127308, Gordon & Breach Publishing Group. Boulder Lecture Notes in Theoretical Physics, Barut, Asim O. (ed. ), 1967, ISBN: 0677129009, Gordon & Breach Publishing Group.